Organized in the summer of 1861 by Major General William F. Smith, and commanded by Brig. Gen. W. T. H. Brooks and Brig. Gen. and Brevet Maj. Gen. L. A. Grant, this brigade fought in whole or part with the Army of the Potomac from the First Bull Run to Appomattox. 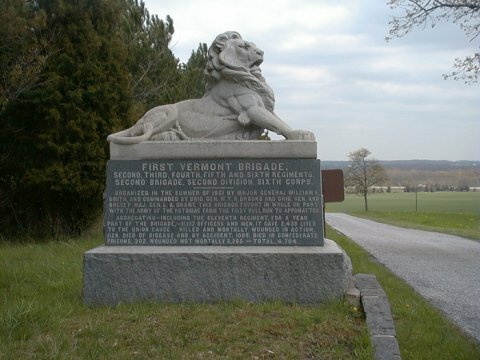 Aggregating-including the Eleventh Regiment, for a year part of the brigade, -11,137 officers and men, it gave 2,439 lives to the Union cause. Killed and mortally wounded in action, 1128. Died of disease and by accident, 1009. Died in Confederate prisons, 302. Wounded not mortally 2,265 - Total, 4,704. Source: Inscriptions from monument; units, commanders, strength and casualties from 1892 Revised Roster.